In 2000, Friends of Acadia and Acadia National Park established Acadia Trails Forever to restore and maintain the park’s historic 130-mile hiking trail system and Acadia became the first national park in the country to have an endowed trail system. The initiative inspired more than 1,100 donors of $35 and up, including the then-largest donation to a Maine environmental organization of $5 million from Ruth and Tris Colket. The Acadia Trails Forever campaign raised $9 million in private donations and $4 million from national park fees. 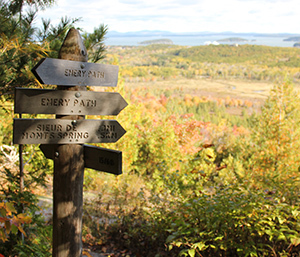 Today, Acadia Trails Forever serves as a model for other national parks and their partners. The partnership’s goals are to rehabilitate Acadia’s historic hiking trail system, reconstruct selected abandoned or unmaintained trails, build village connector trails to restore the once-abundant walking connections to the park, and endow the ongoing maintenance of the trails into the future. The restoration and trailbuilding phase was originally planned as a 10-year project, but the park’s ability to leverage ATF funds toward federal project funding has extended trailbuilding into 2016 and beyond. The Acadia Trails Forever partnership has provided jobs for up to 20 seasonal trail crew members since 2000, and helps support the legions of stewardship volunteers who provide thousands of hours of physical labor each year to keeps the trails in top condition. It funds the Acadia Youth Conservation Corps, a crew of 16 teenagers who work with park trail and road crews every summer; and four Ridge Runners who serve as roving educators, hiking and doing field work with park staff. The best news is that, with the Acadia Trails Forever endowment, the benefits will continue far into the future. Acadia Trails Forever is a successful national model because of the strong partnership between Acadia National Park and Friends of Acadia, and the generosity and vision of our members and donors. Volunteer on Acadia’s historic trail system and have a direct impact on these beloved paths. Whether you have only one morning or a whole season to give, you’ll get to spend meaningful time outside in Acadia, see the park with new eyes, and earn the gratitude of park trail crew and everyone who hikes on the trails. Plus it’s fun!